USNG Data are available, usually in GIS Shapefile format, from the National Geospatial-Intelligence Agency (NGA) and from other providers, such as SharedGeo, that hosts data created by the USNG National Implementation Center (TUNIC) at Delta State University. 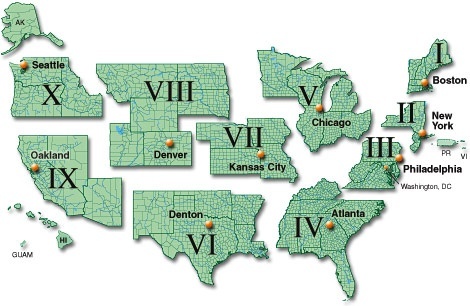 Links to data sources are provide below and organized by FEMA regions and USNG grid zones. Click on FEMA region in map or use link in table below to go to data download page. NGA Data: Worldwide, continent, UTM zone data and example data – Worldwide, continental, UTM zone shapefiles and example 1km and other files available on GIS MGRS page from the National Geospatial-Intelligence Agency (NGA). NGA Data: UTM zone descriptions and data – A good overview of UTM Zones from the National Geospatial-Intelligence Agency (NGA). This page explains how UTM zones are the basis for MGRS Grids. UTM Zone shapefiles area available for download and links to 100km grid download available (also listed below). NGA Data: 100km grids – 100 km shapefiles and related files available via clickable map from the National Geospatial-Intelligence Agency (NGA). MGRS Data Website – The mgrs-data.org website offers downloads of MGRS data. A country and city look up is available to find the correct zone..